The hallmark of Red Giant’s Magic Bullet software products are that they are designed to enhance or stylize images. As their banner states, they focus on “color correction, finishing and film looks for filmmakers.” You can purchase individual software products or a comprehensive suite of tools. I reviewed Magic Bullet Suite 12 a couple a years ago. A few months ago Red Giant released its Magic Bullet Suite 13 update. As in the past, you can purchase it outright or as an upgrade from a previous version. With each iteration of the suite, Red Giant shuffles the mix of products in the toolkit and this version is no different. Magic Bullet Suite 13 is comprised of seven plug-in products, which include Looks 4.0, Colorista IV, Denoiser III, Cosmo II, Mojo II, Film, and the newly added Renoiser. The tools are cross-platform compatible (macOS or Windows), but depending on the editing or compositing software you use, not all of these plug-ins work in every possible host. All of the tools will work in Adobe Premiere Pro or After Effects, as well as Apple Final Cut Pro X. Magic Bullet Looks 4.0 provides the broadest host support, including some less common choices. Looks supports After Effects, Premiere Pro, Final Cut Pro X, Motion, Magix Vegas Pro, Avid Media Composer, DaVinci Resolve, EDIUS, and HitFilm Pro. Colorista only supports the Adobe and Apple hosts, while the other tools support the bulk of possible choices, with the exception Media Composer. Therefore, what you cut or composite with will determine what your best purchase will be – full suite or individual plug-ins. The big selling point of this release is GPU acceleration across the board using OpenGL/OpenCL. 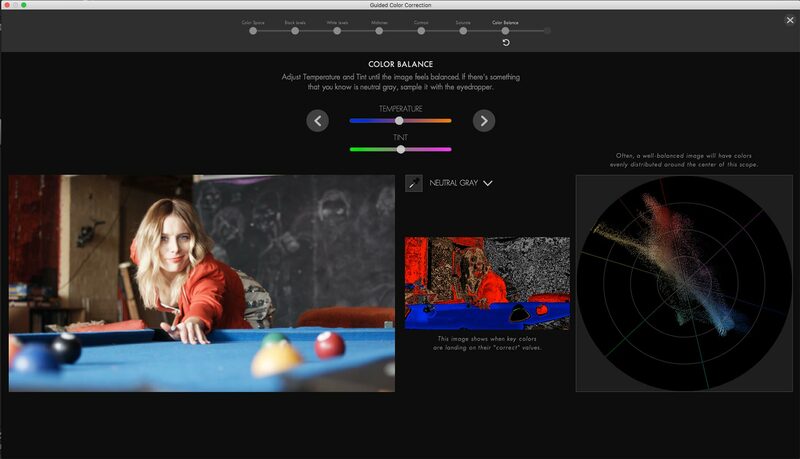 This provides real-time color correction. There are plenty of refinements throughout, but if you are an Adobe user, you’ll note that Colorista IV has embraced Adobe’s panel technology. If you are comfortable with Premiere Pro’s Lumetri Color panel, you can now instead work with Colorista, in this exact same manner. I’ve dabbled a bit with all of these tools in various Avid, Apple, and Adobe hosts. While performance is good and certainly improved, you’ll have the best experience in Adobe After Effects and Premiere Pro. Another advantage you’ll have is Adobe’s built-in masking and tracking tools. 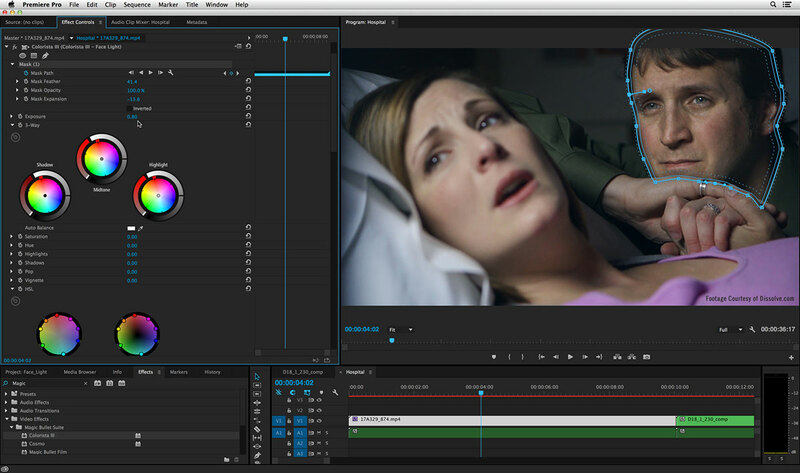 Want to isolate someone’s face and track a Colorista correction to it during a moving shot? No problem, since the Adobe’s features augment any installed plug-in. As an editor, I like to do most of my work within the NLE, but honestly, if you want the best total experience, use these tools in After Effects. That’s where everything shines. I won’t dive into each specific feature, since you can download a free trail version and see for yourself. Plus, you can reread my Magic Bullet Suite 12 review, as many of the main features are similar. But let me note a few items, starting with Looks. This is the grandaddy plug-in of the group, which actually runs as a mini sidebar application. Apply the plug-in, click the “edit” button, and your reference frame opens in the standalone Looks interface. It includes a wealth of tools that can be applied, reordered, and adjusted in near-infinite variations to get just the specific look you desire. There are three helpful features – grading head starts, the ability to save custom presets, and a looks browser. The browser offers a ton of custom presets with a small thumbnail for each. These are updated with the reference frame and as you hover over each, the main viewer window is updated to display that look, thanks to GPU acceleration. If you want to start from scratch, but not sure what the best tools are to use, that’s where the head starts come in. This section includes six starting points that include a series of correction tools in a preset order, but without any tweaks yet applied. Colorista IV is another tools that’s received a lot of attention in this build. I’ve already mentioned the panel, but something really unique is the built-in Guided Color Correction routine. This is designed to guide novice and even experienced editors and compositors through series of color correction steps in the right order. Colorista also gained temperature and tint controls, RGB point curves, log support, and LUTs. The addition of integrated LUTs fills a gap, because Red Giant’s separate LUT Buddy tool has been dropped from Suite 13. The other tools have also gained added features, but let’s not forget the new Magic Bullet Renoiser 1.0. This is designed to give cinematic texture and grain to pristine video and CGI footage. It includes 16 stock presets ranging from 8mm to 35mm. These are labeled based on certain fanciful styles, like “Kung Fu Fighting” or “Classic 35mm”. Renoiser’s settings are completely customizable. There’s a lot to like in this upgrade, but first and foremost for me was the overall zippier operation, thanks to GPU acceleration. If you use these tools a lot in your daily editing and compositing, then Magic Bullet Suite 13 will definitely be worth the update. Red Giant released Magic Bullet Suite 12 in February. Popular tools have been streamlined along with the addition of a brand new film emulation tool. The suite now includes Magic Bullet Looks 3.0, Magic Bullet Colorista III, Magic Bullet Film 1.0, Magic Bullet Mojo 2.0, Magic Bullet Cosmo 2.0, Denoiser II, and LUT Buddy. The new update adds OpenFX compatibility. Along with feature and interface changes, Red Giant has also focused on performance improvements across the board, as well as bringing more of the tools into new hosts like Apple Final Cut Pro X. A single installation of the suite will install the plug-ins into as many application hosts as you have on your system. However, check the compatibility list for your particular NLE. For example, everything installs into Adobe Premiere Pro CC and After Effects CC, but Final Cut Pro X only gets Colorista, Looks, Cosmo, Film, and Mojo. 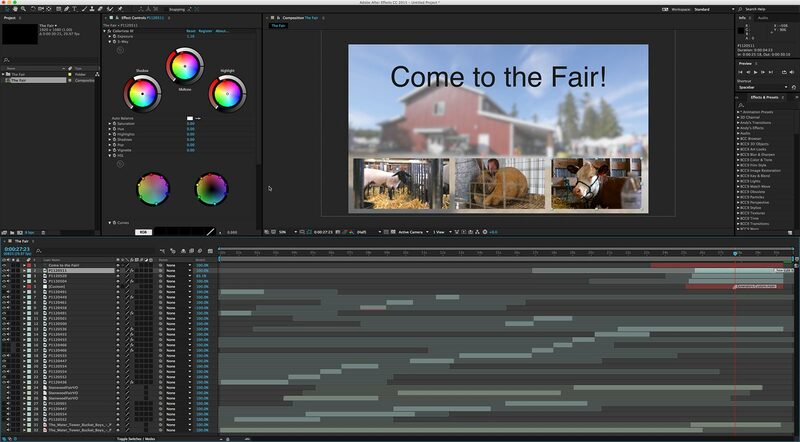 Avid Media Composer is only compatible with Looks and Resolve gets Mojo, Film, Looks, and Cosmo. Depending on your toolkit, you might opt for one or two of the individual plug-ins rather than the entire suite. If you already installed version 12.0, you’ll need to download and reinstall 12.1 in order to add the plug-ins into new hosts, like Resolve 12. Magic Bullet Looks is a popular go-to plug-in for sophisticated stylization of an image. 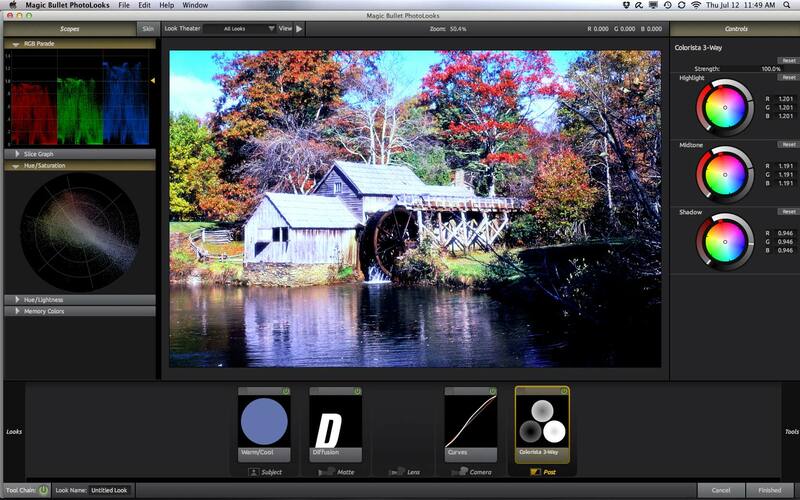 It includes tool modules for color correction, lens effects, relighting, and a lot more. The interface design has been flattened and streamlined. As before, it runs as a separate application that opens whenever you launch the interface from the clip on the timeline. The frame that you are parked on becomes the reference frame to which you apply your looks. In 3.0 and 3.1, you can now hover the mouse over the various preset looks and the larger Looks viewer will be updated to preview that look on your frame. In addition, this will also preview the various tool modules used to create the look. Red Giant has created many new preset looks based on popular film and TV show treatments. All are customizable. The 3.1 update added a Trackpad Mode, enabling you to use a laptop or standalone trackpad like a control surface. 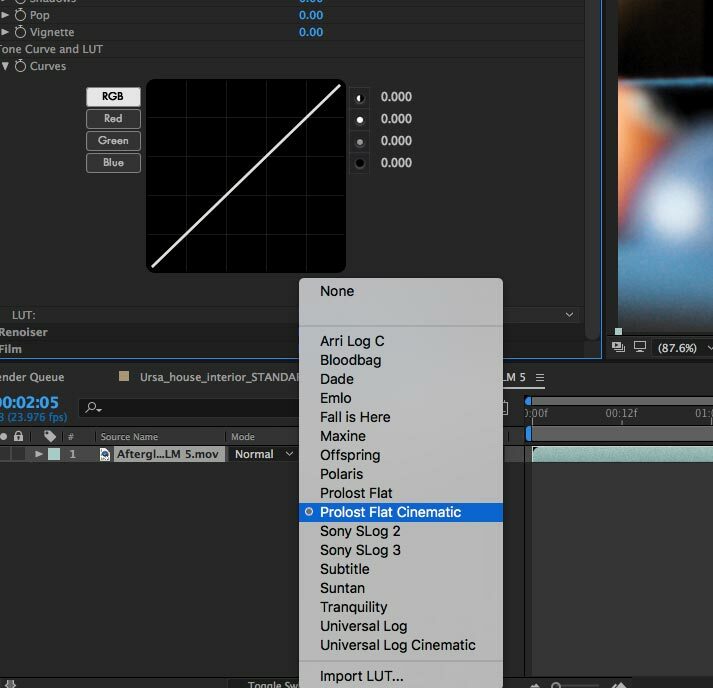 New tool modules have been added, such as a LUT tool and a 4-way color corrector. The latter adds a very intuitive luma range graph to easily change the crossover points between lo/mid and mid/hi. Importing LUTs into Looks doesn’t seem to work perfectly. It’s pretty solid in the Adobe applications, but color management with FCP X is quirky. 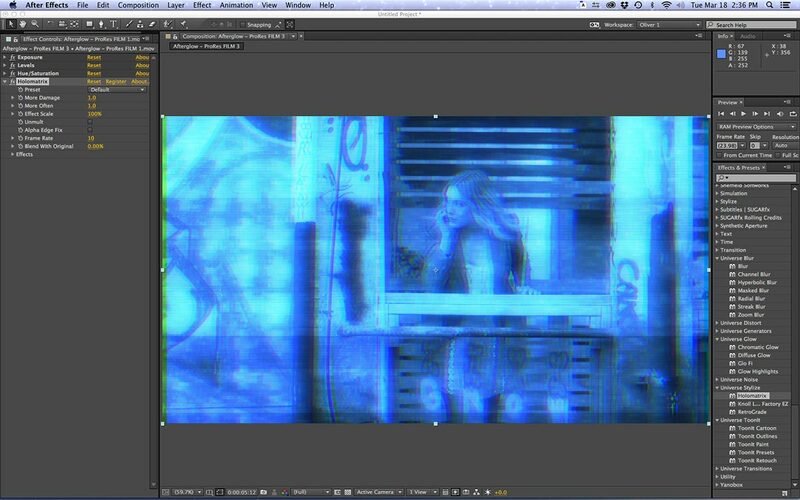 When I imported LUTs into Looks with FCP X, the result was a lot more extreme than in the Adobe applications. This is likely an issue with FCP X’s color pipeline when an external program is involved. The earlier version of Colorista was a feature-packed plug-in that functioned like a mini-grading application. It had master, primary, and secondary grading, plus curves, a power mask, and keyer. With Colorista III, Red Giant decided to simplify the plug-in by including one level of primary grading, curves, a keyer, and HSL secondary adjustments. The power mask is gone, because the developers decided to rely on the new built-in masking that’s part of Premiere Pro CC and Final Cut Pro X. Adobe added bezier masks with built-in tracking to all effects, so if you are using Colorista III in Premiere Pro CC, you now have a better masking capability than in the past. 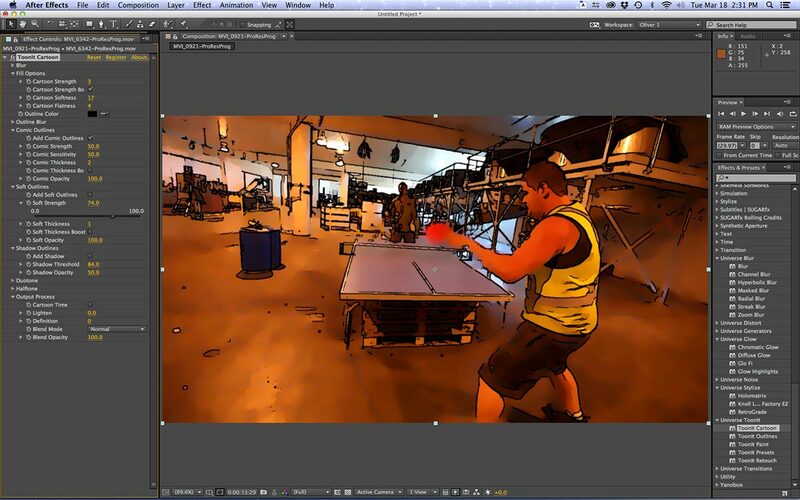 Apple added shape masks to all effects with the introduction of FCP X 10.2. 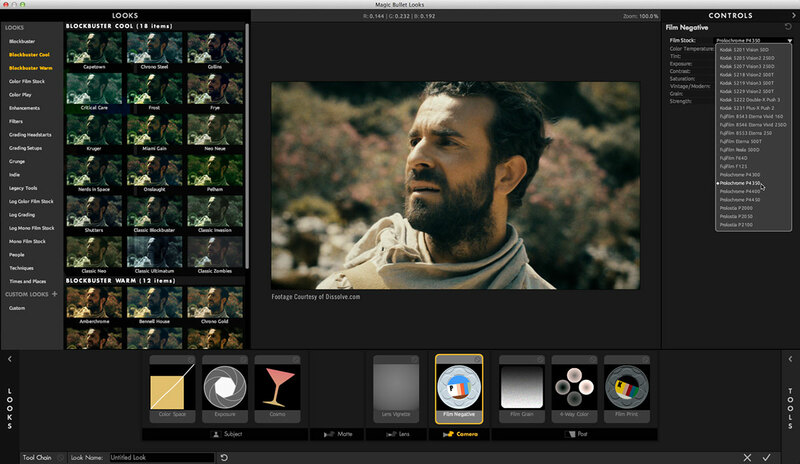 With FCP X, the developers were able to integrate the color grading wheels into the inspector pane, but in a vertical configuration. The response of the wheels is weighted, so that you move the mouse farther in relationship to the puck’s travel on-screen. This results in better granularity to the adjustment, but might require a bit of time for new users to get accustomed to the feel. Although it includes curves, these are not true multi-point curves, as you are limited to five control points along the line. Typically these work best when you want an s-curve correction. 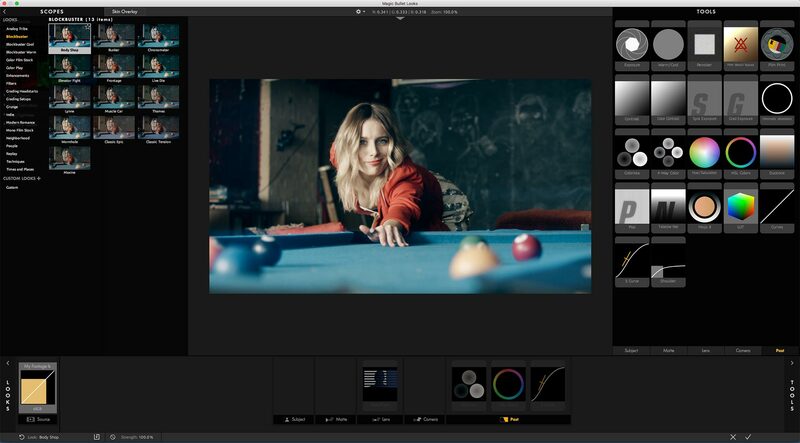 A big addition to Colorista III are Lightroom-style shadow and highlight controls. 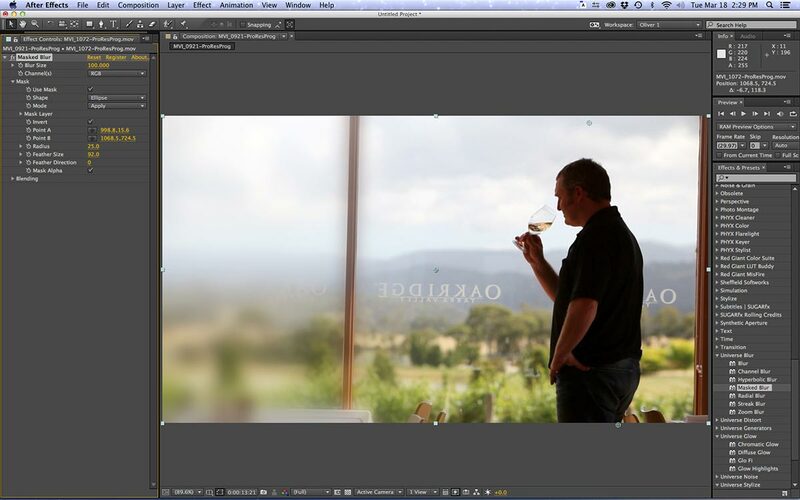 Adjusting the shadows slider acts like you are adding or removing fill light from an image. There’s also a new vignette slider, so you can quickly dial in the size and darkness of an edge vignette. Most of the Magic Bullet products include a strength slider, while enables you to dial back on the amount of the color treatment. This lets you make a more extreme correction and then tone it down for the final look. One welcomed addition is an overall white balance control with a color picker to select what you determine as white in the image. This is very good news for FCP X editors in particular. New 1.1 features, which are applicable to Adobe hosts, include support for OpenCL and Cuda. This allows for real time color correction during video playback via Adobe Premiere Pro’s Mercury Playback Engine. 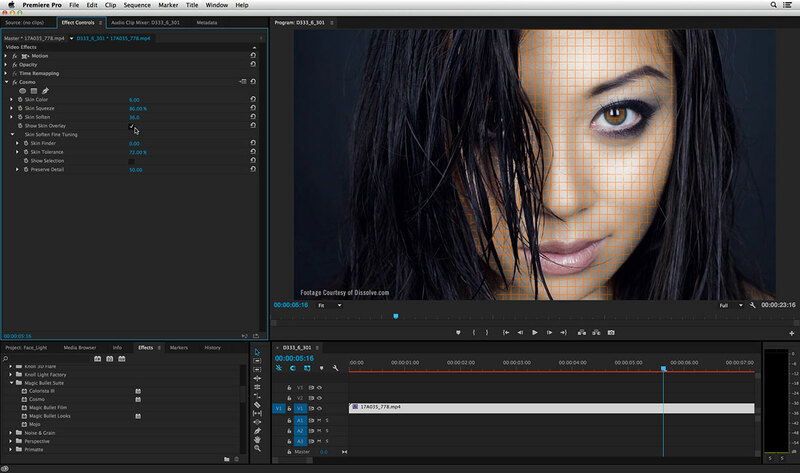 The Skin Overlay is back and there’s a keyer “cut out” mode to create transparency for layered color corrections. Film style LUTs (color look-up tables) are all the rage and this one is particularly well thought-out. Red Giant has reverse-engineering the LUTs from actual film and includes 22 negative stocks and four print stocks. These include the typical Kodak and Fuji variations as well as settings for some imaginary custom stocks designed by Red Giant. The key to this plug-in is that it is intended to pair a film negative LUT with a film print LUT, in order to more accurately mimic a real-world film pipeline. 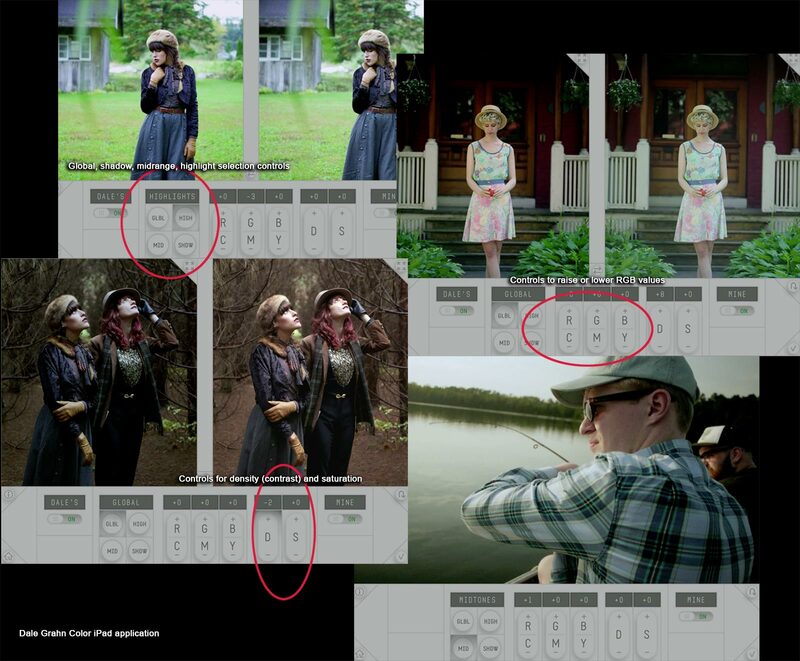 In addition to the LUTs, you have a number of control sliders for tint, exposure, contrast, saturation, and skin tone. There’s a slider for the amount of built-in grain to be added, as well as an instant vignette and a strength slider. A particularly interesting control is the vintage/modern slider. Shift it all the way to modern and you get a very strong orange/teal effect, whereas going fully in the vintage direction leaves the image more reddish and faded. Mojo is for the folks who want the extreme orange/teal coloration that many blockbuster films use. This is my least favorite filter in the suite, because few films that I see actually look like the results you get here – blockbuster or not. It’s a color treatment whose purpose is to cool off the background independent of skin tones. Depending on the shot and the art direction used in production, sometimes you get great results and other times not so much. 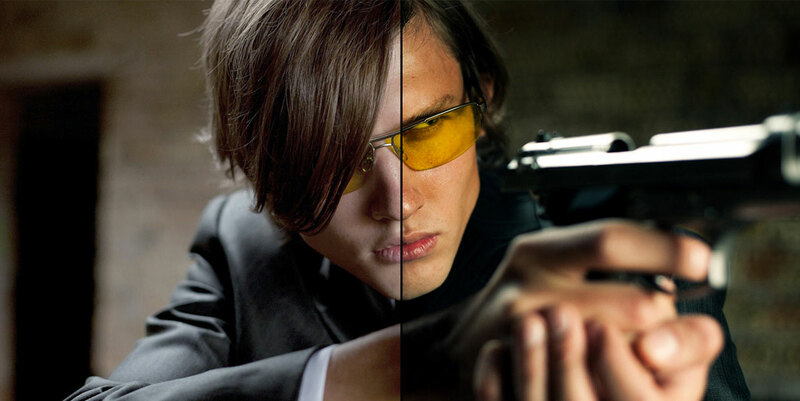 Fortunately there are plenty of adjustments to derive a decent, albeit stylized, color correction. As part of the Looks refresh, there is now a set of Mojo tools built into Looks, as well. Mojo has also been GPU-accelerated. Red Giant claims it’s 20% faster in Adobe products and 80% faster in FCP X. In the testing that I’ve done, the results have been in line with these numbers. Cosmo is a skin smoothing filter. It’s effectively the “vaseline on the lens” trick. If you have an actress with more textured skin and you need to soften it, then Cosmo does one of the better jobs I’ve seen. It isolates skin from the background, so that you end up softening only skin without hurting background detail. The new version has good performance, so you can keep on working with the filter applied without having to render to continue. Cosmo is GPU-accelerated with a 20% bump in Adobe products. In addition to FCP X, it is also available in Sony Vegas Pro. Denoiser II is general solution for reducing video noise and works well with most footage. LUT Buddy is a tool included with a number of Red Giant products. It is designed to import and export LUTs, although in my testing behavior was inconsistent. I could get it to generate a LUT, but not import all LUTs that should have been compatible. 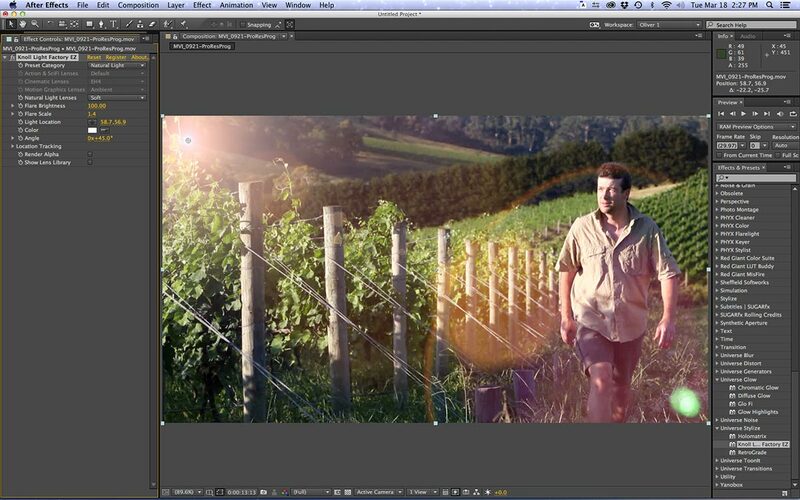 LUT Buddy is very useful for turning the grade you create in one application into a LUT that can be used in another. For example, you can use a number of different color correction filters in After Effects to grade a shot and then use LUT Buddy to turn that grade into a LUT. Then in Premiere Pro, apply the LUT that you created, without the need for using the same filters as were used in After Effects. Here’s where LUT Buddy should have worked to read its own grade, but it didn’t. 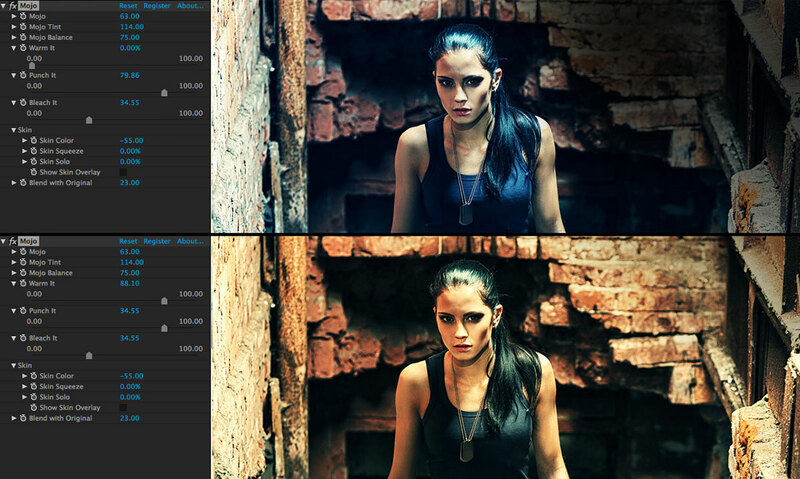 When I applied the grade and played the clip, the color correction would flicker on and off. However, I was still able to import that LUT using Premiere Pro’s Lumetri filter, so the process is still functional. My initial testing was done with Adobe CC2014, but in retesting in Adobe CC2015, unfortunately I could no longer get LUT Buddy to export a LUT. Overall, this a solid update. Better performance and new tools. In most hosts you can stack several instances of these filters and still get real-time playback, which is a significant step forward. Magic Bullet Suite 12 is the perfect package for editors that want to have plenty of control over the look of their image, yet stay inside the editing application. To usher in Magic Bullet Suite 12, Red Giant produced another of its innovative short films, called “Old/New”. 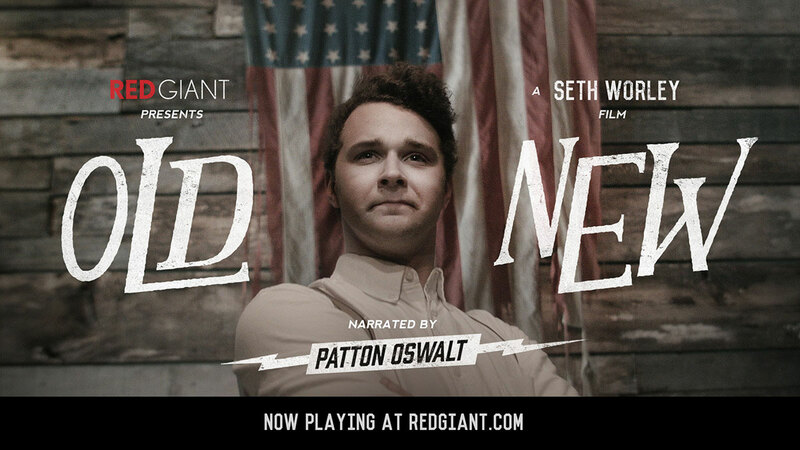 It’s directed by Seth Worley and narrated by Patton Oswalt. Along with a clever storyline, the film was produced using a wide range of Red Giant products. Make sure that you check out the behind-the-scenes video to see how they did it. Automatic Duck invented timeline translations between applications. Necessity is the mother of invention, leading Wes Plate, an Avid Media Composer editor who tackled compositing in Adobe After Effects, to team with his programmer father, Harry. The goal was to design a tool to get Avid timelines into After Effects compositions. Automatic Duck grew from this beginning to create a series of translation products that let editors seamlessly move timelines between a number of different hosts, including Media Composer, Pro Tools, After Effects, and Apple Final Cut Pro “classic”. Four years ago Adobe licensed the IP for the original Automatic Duck Pro Import products, as well as brought the father/son team on board to develop tools for Adobe. Now they are back on their own and have decided to reboot Automatic Duck, which has been mothballed for the past four years. Seeing an opportunity in Apple’s Final Cut Pro X, the company has developed Ximport AE, a timeline translation tool to bring Final Cut Pro X projects (edited sequences) into After Effects. The team is no stranger to Final Cut Pro X’s new FCPXML format, since it was the first developer to create a companion utility that translated Final Cut Pro X 10.0 projects into Pro Tools sessions. First, let’s define the market. Who is Automatic Duck Ximport AE for? Editors who do most of their heavy lifting in Media Composer, Final Cut, or Premiere Pro might not see the attraction. On the flip side, though, there are quite a few editors for whom After Effects is the tool of choice for all effects and even finishing. For this group, the NLE is where they spend the least amount of time. They use an editing application for shot selection and assembly and then go straight to After Effects for everything else. If you are a motion graphics designer who relies on After Effects, then your occasional need for an NLE might be best served by FCP X. The interface is fast and easy to master, compared with more traditional track-based edit software. Finally, if you are a dedicated FCP X editor, you no longer have a “send to Motion” function as in the old Final Cut Studio. This means you can’t send more than a single shot to Motion for treatment. Besides, After Effects may still be your preferred motion graphics application. Take all of these points into consideration and you’ll see that there’s a clear need to get a project from FCP X into After Effects – the industry’s dominant motion graphics application. 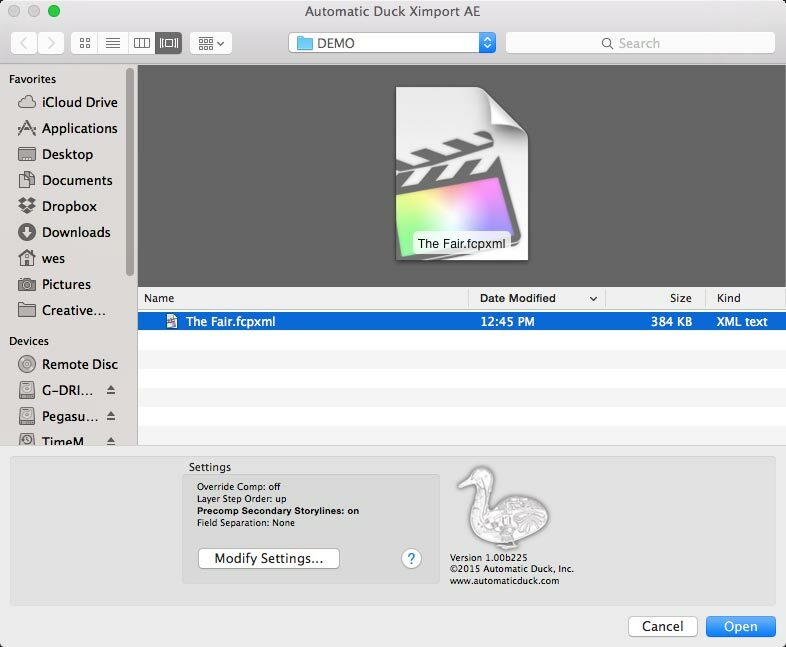 Automatic Duck Ximport AE is designed as a plug-in that’s installed into After Effects, including CS6 up through the current CC2015 version (and beyond). There are several other competing translation tools on the market, which convert between flavors of XML or from FCPXML into AE Scripts. 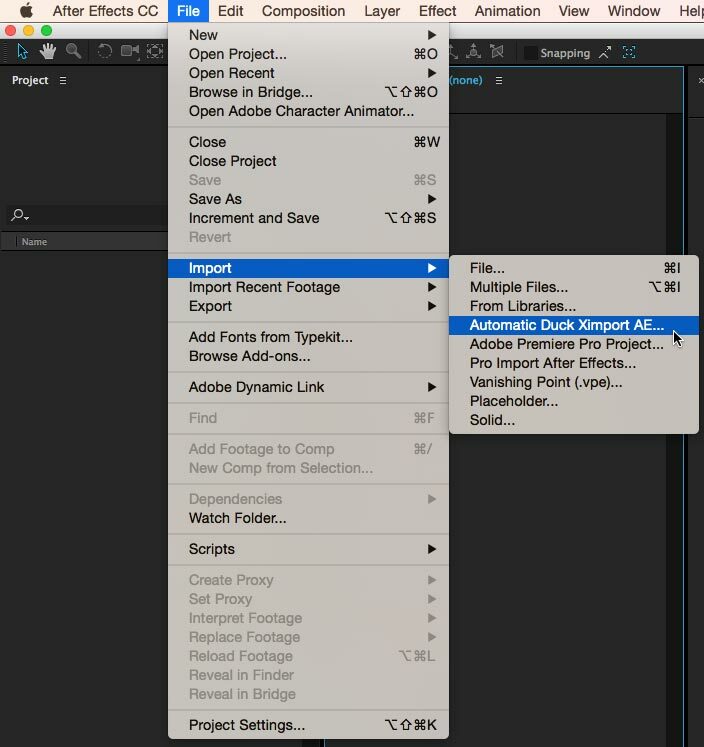 Automatic Duck is the only one that integrates directly into the After Effects import menu. Ximport AE cuts out one middle step in the process and should provide for a more complete translation from FCP X into After Effects. I’ve been beta testing the product for a few months and it certainly hits the mark for serious users. The steps are simple. Just cut your sequence in Final Cut Pro X and then export an FCPXML for that project (sequence). When you open After Effects, select File > Import > Automatic Duck Ximport AE. This opens a dialogue box with a few settings and it’s where you navigate to the correct FCPXML file. Settings include whether to let your clips cascade up or down in the After Effects timeline, as well as an option to create pre-comps from Final Cut’s secondary storylines. The question mark icon also launches the user guide. In the timelines I’ve tested, the translation is quite good. Compound clips are packaged as pre-comps. The active angle of Multicam clips and the selected pick of Audition clips are translated. Alternate angles aren’t. Generally transform, crop, opacity, and blend functions are supported, as are audio and video keyframes. A number of third party filters are accurately translated between applications, assuming that the same filter is installed into each host. At launch, these include selected plug-ins from Boris FX, Digital Anarchy, Noise Industries/FxFactory, PHYX, Red Giant, and Yanobox. Check the user guide for a detailed list with specific filters. It’s worth noting, however, that just about all of the built-in FCP X filters are not translated into an equivalent filter in After Effects. For example, the color board metadata is included in the FCPXML, but there’s no way to read that info on the After Effects side. This is true even when there are filters that appear to be the same. For example, both hosts include a native Gaussian blur filter, yet that doesn’t get translated. On the other hand, if you apply a Flipped filter in FCP X, it will be correctly translated into the -100 transform scale value in After Effects. So again, read the user guide and do a little experimentation to see what works and what doesn’t in your projects. Whenever an effect is not supported, a note is made in the companion HTML file created at import. A marker is also placed on that clip in the After Effects timeline, naming the missing plug-in. I tested a number of supported third-party products, staying mainly within the Red Giant family. Translation was good between the Magic Bullet tools, but not without issue. For example, Universe ToonIt Expressionist Noise was available in both hosts, yet the effect was not applied in the After Effect composition. That’s because at the time I tested this using a beta build, that specific Universe filter had not been included. This has since been corrected. Other effects, like Looks, Colorista III, Mojo, Universe Glow, and others worked flawlessly. According to Wes Plate, the plug-in has been architected in a way to easily add support for new effects plug-ins. The bottom line is that if you stay within the supported features, you will get the richest translation experience from FCP X into After Effects that’s currently available in the market. 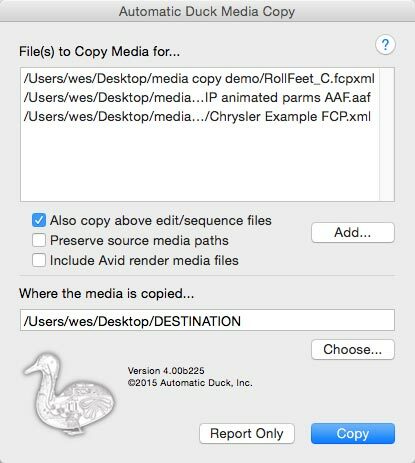 Along with Ximport AE, the company will also introduce Automatic Duck Media Copy 4.0. The original Media Copy grew out the need to collect, copy, and move sequences and their associated media. The original version worked for Avid Media Composer and Apple Final Cut Pro “classic” sequences. It would read either the AAF or XML file and copy all associated media, plus the timeline edit info. This new folder could then be moved to another system for more editing or used as a back-up archive. Media Copy 4.0 has been updated to add FCPXML support. As before, it collects media and timeline files for use elsewhere. It does not trim or transcode the media, but you have the choice to copy media all into a single folder or to maintain a folder hierarchy matching the original paths within the newly created location. Media Copy works well as a standalone application or as a companion to Ximport AE. 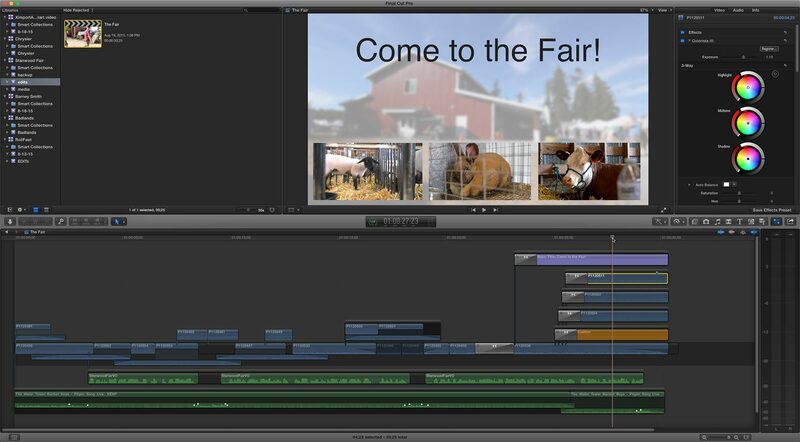 It supports Avid Media Composer, Final Cut Pro X, and Final Cut Pro 6/7. With the reboot of Automatic Duck, they’ve decided to partner with Red Giant Software to provide marketing, sales, and customer support. Red Giant will offer Automatic Duck Ximport AE for $199 and Media Copy 4.0 for $99. If you still have need for Automatic Duck’s legacy products, the company is posting them again on their own website for free, with an optional “donate” button. These include Pro Import FCP, Pro Export FCP (for FCP 7 users), and Pro Import AE (for importing AAF and XML into AE CS 5.5 or earlier). Regardless of which NLE you use, I’ve found Media Copy to be an essential tool, whether or not you work with effects or motion graphics. It’s great to see Automatic Duck update it, as well as launch their next great product, Ximport AE. Adobe After Effects will continue to be the ubiquitous compositing and motion graphics choice for most editors, so this marriage between Final Cut Pro X and After Effects make great sense. For more, here’s a good interview with Wes Plate at Red Shark News. Red Giant Software, developers of such popular effects and editing tools as Trapcode and Magic Bullet, recently announced Red Giant Universe. Red Giant has adopted a hybrid free/subscription model. Once you sign into Universe for a Red Giant account, you have access to all the free filters and transitions that are part of this package. Initially this includes 31 free plug-ins (22 effects, 9 transitions) and 19 premium plug-ins (12 effects, 7 transitions). Universe users have a 30-day trial period before the premium effects become watermarked. Premium membership pricing will be $10/month, $99/year or $399/lifetime. Lifetime members will receive routine updates without any further cost. The general mood among content creators has been against subscription models; however, when I polled thoughts about the Universe model on one of the Creative COW forums, the comments were very positive. I originally looked at Red Giant’s early press on Universe and I had gotten the impression that Universe would be an environment in which users could create their own custom effects. In fact, this isn’t the case at all. The Universe concept is built on Supernova, an internal development tool that Red Giant’s designers use to create new effects and transitions. Supernova draws from a library of building block filters that can be combined to create new plug-in effects. This is somewhat the same as Apple’s Quartz Composer development tool; however, it is not part of the package that members can access. Red Giant plans to build a community around the Universe members, who will have some input into the types of new plug-ins created. These plug-ins will only be generated by Red Giant designers and partner developers. Currently they are working with Crumplepop, with whom they created Retrograde – one of the premium plug-ins. The point of being a paid premium member is to continue receiving routine updates that add to the repertoire of Universe effects that you own. In addition, some of the existing Red Giant products will be ported to Universe in the future as new premium effects. This model is similar to what GenArts had done with Sapphire Edge, which was based on an upfront purchase, plus a subscription for updated effects “collections” (essentially new preset versions of an Edge plug-in). These were created by approved designers and added to the library each month. (Note: Sapphire Edge – or at least the FX Central subscription – appears to have been discontinued this year.) Unlike the Sapphire Edge “collections”, the Universe updates are not limited to presets, but will include brand new plug-ins. Red Giant tells me they currently have several dozen in the development pipeline already. Red Giant Universe supports both Mac and Windows and runs in recent versions of Adobe After Effects, Premiere Pro, Apple Final Cut Pro X and Motion. At least for now, Universe doesn’t support Avid, Sony Vegas, DaVinci Resolve, EDIUS or Nuke hosts. Members will be able to install the software on two computers and a single installation of Universe will install these effects into all applicable hosts, so only one purchase is necessary for all. After Universe is installed, the updates are managed through the Red Giant Link utility. This will now keep track of all Red Giant products that you have installed (along with Universe) and lets you update as needed. The effects themselves are nice and the quality is high, but these are largely standard effects, so far. There’s nothing major yet, that isn’t already represented with a similar effect within the built-in filters and transitions that come as part of FCP X, Motion or After Effects. Obviously, there are subjective differences in one company’s “bad TV” or “cartoon” look versus that of another, so whether or not you need any additional plug-ins becomes a personal decision. As far as GPU-acceleration is concerned, I do find the effects to be responsive when I adjust them and preview the video. This is especially true in a host like Final Cut Pro X, which is really tuned for the GPU. For example, adding and adjusting a Knoll lens flare from the Universe package performs better on my 2009 Mac Pro (8-core with an NVIDIA Quadro 4000), than do the other third-party flare filters I have available on this unit. The field is pretty crowded when you stack up Universe against such established competitors as GenArts Sapphire, Boris Continuum Complete, Noise Industries FxFactory Pro and others. As yet, Universe does not offer any tools that fill in workflow gaps, like tracking, masking or even keyers. I’m not sure the monthly subscription makes sense for too many customers. It would seem that free will be attractive to many, while an annual or lifetime subscription will be the way most users will purchase Universe. The lifetime price lines up well when you compare it to the others, in terms of purchasing a filter package. Red Giant Universe is an ideal package of effects for editors. While Apple has developed a system with Motion where any user can created new FCP X effects based on templates, the reality is that few working editors have the time or interest to do that. They want effects that can be quickly applied with a minimum amount of tweaking and that perform well on a timeline. This is what impresses clients and what wins over editors to your product. With that target in mind, Red Giant definitely will do well with Universe if it holds to its promise. Ultimately the success of Universe will hang on how prolific the developers are and how quickly new effects come through the subscription pipeline. All of our concepts stem from the film lab process known as color timing. Originally this described the person who knew how long to leave the negative in the chemical bath to achieve the desired result (the “timer”). Once the industry figured out to manipulate color in the negative-to-positive printing process, the “color timer” was the person who controlled the color analyzer and who dialed in degrees of density and red/blue/green coloration. The Dale Grahn Color iPad application will give you a good understanding of this process. Alexis Van Hurkman also covers it in his “Color Correction Handbook”. Electronic video color correction started with early color cameras and telecine (film-to-tape transfer or “film chain”) devices. These were based on red/blue/green color systems, where the video engineer (or “video shader”) would balance out the three components, along with exposure and black level (shadows). He or she would adjust the signal of the pick-up systems, including tubes, CCDs and photoelectric cells. RCA added circuitry onto their cameras called a chroma proc, which divided the color spectrum according to the six divisions of the vectorscope – red, blue, green, cyan, magenta and yellow. 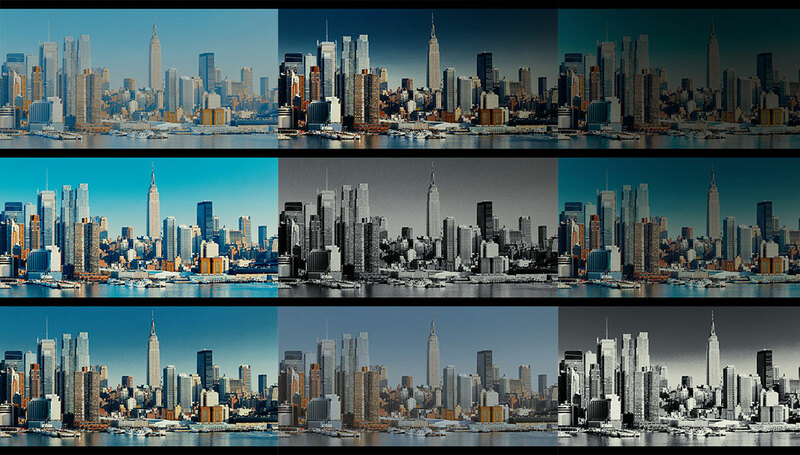 The chroma proc let the operator shift the saturation and/or hue of each one of these six slices. For instance, you could desaturate the reds within the image. Early color correction modules for film-to-tape transfer systems adopted this same circuity. The “primary” controls manipulated the actual pick-up devices, while the “secondary” controls were downstream in the signal chain and let you further fine tune the color according to this simple, six-vector division. Early color correction system were built to transfer color film to air or to videotape. They were part machine control and part color corrector. Modern color correction for post production came to be, because of these three key advances: memory storage, scene detection and signal decoding. Memory storage. Once you could store and recall color correction settings, then it was easy to go back and forth between camera angles or shots and apply a different setting to each. Or you could create several looks and preview those for the client. The addition of this technology was the basis for a seminal patent lawsuit, known as the Rainbow patent suit, as the battle ranged over who first developed this technology. Scene detection. Film transfer systems had to play in real-time to be recorded to videotape, which meant that shot changes had to trigger the change from one color correction setting to the next. Early systems did this via the operator manually marking an edit point (called “notching”), via an EDL (edit decision list) or through automatic scene detection circuitry. This was important for the real-time transfer of edited content, including film prints, cut negative and eventually videotape programs. Signal decoding. The ability of color correction systems to decode a composite or component analog (and later digital) signal through added hardware, shifted color correction from camera shading and film transfer to being another general post production tool at a post facility. The addition of a signal decoder board in a DaVinci unit split the input signal into RGB parts and enabled the colorist to enhance the correction of an already-edited master using the “secondary” signal electronics of the system. This enabled “tape-to-tape” color correction of edited masters. Thanks to scene detection or an EDL, color correction could be shot-to-shot and frame-accurate, when played back in real-time for its re-encoded, corrected output back to a second videotape master. Eventually the tools used in hardware-based, tape-to-tape color correction systems became standard. Quantel and Avid led the way by being first to incorporate these features into their nonlinear editing software. Color correction software tends to break up its control into primary and secondary functions. As you can see from the earlier explanations, there’s really no reason to do that, since we are no longer controlling the pick-up devices within a camera or telecine. Nevertheless, it’s terminology we seem to be comfortable with. Often secondary controls enable masking and keys to isolate color – not because it has to be that way – but, because DaVinci added these features into their secondary control set. In modern correction tools, any function could happen on any layer, node, room, etc. The core language for color manipulation still boils down to the simple controls exemplified by the Dale Grahn app. A signal can be brighter, darker, more or less “dense” (contrast) and have its colorimetry shifted by added or subtracting red, blue or green for the overall image or in the highlight, midrange or shadow portions of the image. This basic approach can be controlled through sliders, knobs, color wheels and other user interfaces. Different software applications and plug-ins get to the same point through different means, so I’ll cover a few approaches here. Bear in mind, that since some of these actually represent somewhat different color science and math, examples that I present might not yield exactly the same results. Many controls are equivalent in their effect, though not necessarily identical in how they affect the image. A common misconception is that shadow/mid/highlight controls on a 3-way color corrector will evenly divide the waveform into three discrete ranges. In fact, these are very large, overlapping ranges that interact with each other. If you shift a shadow luminance control up, it doesn’t typically just expand or compress the lower third of the waveform. Although some correctors act this way, most tend to shift the whole waveform up or down. If you change the color balance of the midrange, this color change will also affect shadows and highlights. The following is a quick explanation of some of the popular color control models. Contrast and temperature controls have recently become more popular and are considered a more photographic approach to correction. When you adjust contrast, the image levels expand or stretch as viewed on a waveform. Highlights get brighter and shadows deepen. This contrast expansion centers on a pivot point, which by default is at the center of the signal. If you change the pivot slider you are shifting the center point of this contrast expansion. In one direction, this means the contrast control will stretch the range below the pivot point more than above it. Shift the pivot slider in the other direction for the opposite effect. Color temperature and tint (also called magenta) controls balance the red/blue/green signal channels in relationship to each other. If you slide a color temperature control while watching an RGB parade display on a waveform, you’ll note that adjustments shift the red and blue channels up or down in the opposite direction to each other, while leaving green unaffected. When you adjust the tint (or magenta) slider, you are adjusting the green channel. As you raise or lower the green, both the red and blue channels move together in a compensating direction. The SOP model is used for CDL (color decision list) values and breaks down the signal according to luma (master), red, green and blue and are expressed in the form of plus or minus values for slope, offset and power. Scratch Play’s color adjustments are a good example of the SOP model in action. Slope is equivalent to gain. Picture the waveform as a diagonal line from dark to light. As you rotate this imaginary line, the higher part becomes taller, which represents brightness values. Think of the slope concept as this rotating line. As such, its results are comparable to a contrast control. The offset control shifts the entire signal up or down, similar to other shadow or lift controls. The power control alters gamma. As you adjust power, the gamma signal is curved in a positive or negative direction, effectively making the midrange tones lighter or darker. The LGG model is the common method used for most 3-way color wheel-style correctors. It effectively works in a similar manner to contrast and SOP, except that the placement of controls makes more sense to most casual users. Gain, as the name implies, increases the signal, effectively expanding the overall values and making highlights brighter. Lift shifts the entire signal higher or lower. Changing a lift control to darken shadows, will also have some effect on the overall image. Gamma bends the curve and effectively makes the midrange values lighter or darker. The portions of the signal altered by highlight/shadow/midrange controls (like SOP, LGG or other) overlap. If you change the color balance for the midrange tones, you will also contaminate shadows and highlights with this color shift. The extent of the portion that is affected is controlled by a luma range control. Many color correction applications do not give you control over shifting the crossover points of these luma ranges. Some that do, include Avid Symphony, Synthetic Aperture Color Finesse and Adobe SpeedGrade. Each offers curves or sliders to reduce or expand the area controlled by each luma range and effectively tightens or widens the overlap or crossover between the ranges. DaVinci Resolve includes a similar function within its log-style color wheels panel. It uses range adjustments that can limit the area affected by the balance and saturation controls. Similar results may be achieved by using HSL keyers or qualifiers that include softening controls. Video signals are made up of red, blue and green channel information. It is not uncommon for properly-balanced digital cameras to still maintain a green color cast to the overall image, especially if log-profile recording was used. Here, it’s best to simply balance the overall channels first to neutralize the image, rather than attempt to do this through color wheel adjustments. Some software uses actual channel controls, so it’s easy to make a base-level adjustment to the output or mix of a channel. If your software uses printer lights, you can achieve the same results. Printer lights harken back to lab color timing, using point values that equate to color analysis values. Regardless, dialing in a plus or minus red/blue/green printer light value effectively gives you the same results as altering the output value of a specific color channel. This is just a short post to go over some of the more confusing terminology found in modern color correction software. Many applications tend to blend the color science models, so as you apply the points mentioned to your favorite tool, you may see somewhat different results. Hopefully I’ve gotten you in the ballpark, in order to understand what happens when you twirl the knob the next time. Thanks to the growth of the internet, laptops and now tablets, the use of physical portfolios and demo reels to show your wares has been increasingly replaced by digital alternatives. The newest of these is Red Giant Software’s Arsenal application for the Apple iPad. This is a mobile presentation application designed to present your creative work to clients using an iPad. Arsenal is easy to use and supports the presentation of both still images and video. You can import images by syncing folders with your iPad, via FTP and Dropbox. Multiple presentations can be organized in the Light Table display. Arsenal uses a series of Collections, each of which can hold several Strips. Once you pick the Collection to load, the available Strips are displayed. For a Strip of photographs, simply swipe the Strip with your finger in a standard iPad gesture and you can scroll through the images to see what is available in that Strip. Tap any image to display it full screen. From the full screen mode, you can swipe left or right to change images, set up a slideshow with automatic advance (three, five or eight seconds) or access any image from a small film strip at the bottom. Arsenal offers a set of editing controls to add, move or delete images, name Collections and Strips (with choices of font style and size and theme colors), as well as add your logo at the top. Syncing is a big part of the application. You can e-mail a customer an Arsenal file that’s synced via Dropbox. The customer can run this file on their iPad using a free Arsenal Reader application and the images stay updated via Dropbox. In addition, you can also e-mail any image to another person from within Arsenal as a standard e-mail attachment. Arsenal currently supports all three iPad models, JPEG and PNG images, plus MOV and MP-4 video files. There’s full support for the new iPad’s Retina display with images up to 5,000 pixels (3,000 for the original iPad model). I tested Arsenal on my first generation iPad, using still photos from my Olympus point-and-shoot camera as well as older 35mm slide scans. A few of these exceeded 3,000 pixels, but didn’t present any problems. I prefer manual sync for my iPad and have an “iPad Transfer” folder on my desktop computer where I copy files headed for the iPad. Stills or movies that I’ve synced are accessible by Arsenal to be organized into Collections and Strips. 720p/23.98 H.264 MOV files at 5Mbps play nicely on the iPad and look great full screen on this first generation device. My only complaint is that videos don’t offer a thumbnail for quick visual recognition. Remember that productions use stills in lots of ways, including casting photos, location scouting stills and behind-the-scenes shots. All of these uses can find a home with Arsenal. 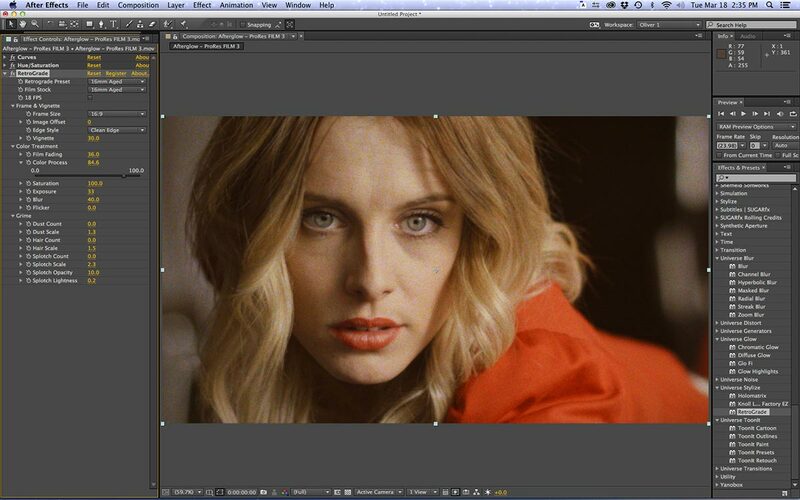 Red Giant Software launched the preset-based “looks” market, when it originally released the browser version of Magic Bullet Looks. Visual effects director and software designer Stu Maschwitz overhauled the original product to create a self-contained color correction and “looks creation” interface, where tools were grouped according to how they fit into the flow from in-front of the camera to post. 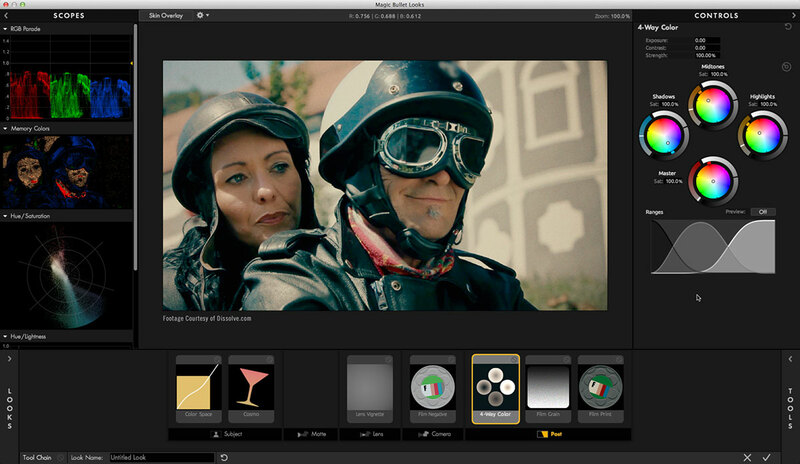 Magic Bullet Looks ships with tools and a number of presets, which can quickly be previewed on an image. The software is built as a separate application that is linked into most standard NLEs and compositors as a plug-in. This design spawned a still photography version, called PhotoLooks, which uses the same basic engine. For still photography, PhotoLooks installs as a plug-in to Adobe Photoshop and Lightroom and Apple Aperture. Last year Red Giant Software brought out Magic Bullet Looks 2.0, which is also sold as part of the Magic Bullet Looks Suite 11. This featured a more streamlined Looks interface and additional tools, like Cosmo (a skin smoothing tool), but the PhotoLooks version was stuck with the old skin. Now the two have parity, with the recent update of the suite and PhotoLooks 2.0. Purchase PhotoLooks separately or get it included with the suite. Once again, both Magic Bullet Looks (for video) and PhotoLooks (for stills) feature a consistent appearance and a common set of tools and presets. Magic Bullet PhotoLooks 2.0 is available as a plug-in to Photoshop, Aperture or Lightroom, but may also be accessed by launching the PhotoLooks application. When you use it as a plug-in, you gain the benefits of round-tripping between the applications. 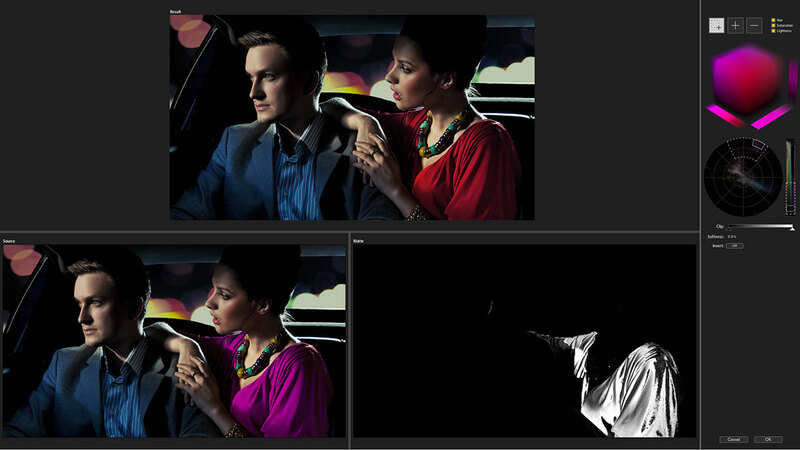 In Aperture and Lightroom, both before and after version are saved, to guarantee that the process is non-destructive. If you open PhotoLooks separately, you can import JPEGs, PNGs and TIFFs, but the adjusted image can only be saved as a JPEG. Custom looks can also be exported for use elsewhere. Along with the new interface and Cosmo, other new features include four new scopes, faster GPU-enabled processing and 3-way color correction tools based on Magic Bullet’s popular Colorista filter. Creating an original look is as simple as dragging a tool into one of the categories (subject, matte, lens, camera, post) and then tweaking the setting to your liking. A tool isn’t limited to a specific category, so “post” tools can be applied in the “subject” position, as well as the other way around. You are simply creating a chain of filter effects, much like audio engineers do with audio filters. Once you get the desired result either save that as a new preset or exit back to the host program, where the image will appear with that look applied to it.